Clayton Thorson passes the ball. The sophomore quarterback is on pace to throw 408 passes in 2016. 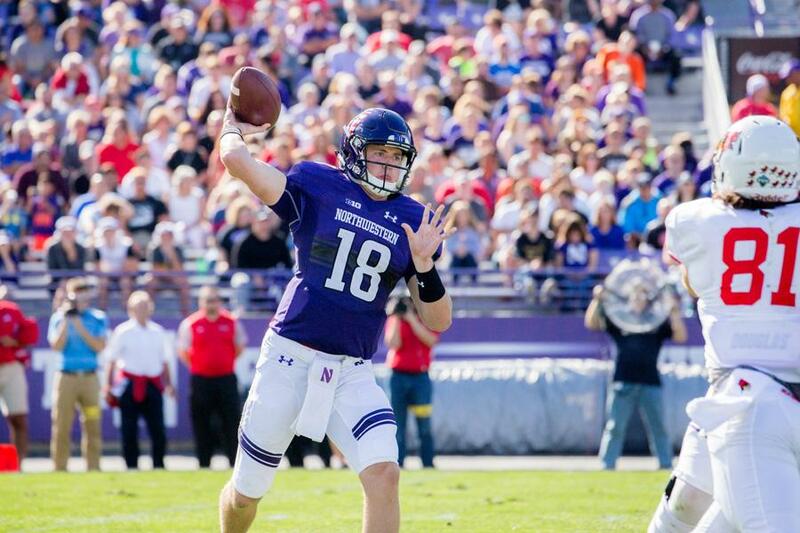 For the second straight fall, Northwestern’s offense can seem predictable. Just not in the way you’d expect. Over the past two-plus seasons, the Wildcats’ offensive identity has been based on a ground-and-pound attack that used junior running back Justin Jackson to run down opponents’ throats. In 2014, Jackson became just the second freshman in program history to rush for at least 1,000 yards. Last season, he finished third in the nation with 312 carries, behind only Alabama’s Heisman-winning back Derrick Henry and Stanford’s Heisman runner-up Christian McCaffrey. But through three games in 2016, the Wildcats (1-2) seem to have shifted their gameplan to one that revolves around sophomore quarterback Clayton Thorson. Over the past two weeks, Thorson has thrown 80 passes — a career-high 41 against Illinois State and 39 against Duke, his second-highest total. Though NU appears to have deviated from its usual offensive plan, Thorson said he doesn’t mind. In a way, the new willingness to throw the ball is a callback to Cats’ offenses of yesteryear. In 2009, starting quarterback Mike Kafka averaged nearly 38 pass attempts per game. Dan Persa followed, throwing nearly 30 times a game in the next two seasons. Even Trevor Siemian, now starting games for the NFL’s Denver Broncos, averaged about 36 passes per game as a senior in 2014. But Jackson has been such a playmaker for NU that coach Pat Fitzgerald had appeared to adjust around his best weapon, force-feeding him the ball. Then came this year’s offensive shift. Given how much success the Cats have had running the ball in the past, the new approach may at first seem like an “If it ain’t broke, don’t fix it” situation. Although Thorson did set another personal record with 320 passing yards against the Blue Devils, he’s completed fewer than 50 percent of his passes in each of the past two games and in a whopping 10-of-16 career starts. But Fitzgerald said opening up the playbook is a “byproduct” of opposing defenses focusing heavily on NU’s run game. The Cats have averaged just 2.8 yards per carry this season, due mostly to a struggling offensive line. In addition, Duke threw “every blitz ever known to man” at NU, Fitzgerald said, making it harder for the Cats to get in a groove. Some aspects of the passing game were working, however, as Thorson connected on five passes longer than 25 yards last week. In 2015, NU had 12 such plays all season. In particular, Thorson has developed a rapport with senior Austin Carr, who leads the Big Ten in receptions and receiving yards. Carr has made the loss of superback Dan Vitale much more bearable — Vitale led NU with 355 receiving yards last season, but Carr already has 283 in three games. Thorson has also spread the ball around quite well, hitting eight different pass-catchers through the first three weeks. In particular, junior Macan Wilson has thrived, catching his first five career passes for 103 yards. Wilson said the receivers spent extra time with Thorson and the other quarterbacks in the offseason to help build the relationship between the two position groups. Even though Thorson is on pace to throw over 400 passes in 2016, Jackson is still finding work. The junior has felt the brunt of the struggling offensive line and exotic blitz schemes, and as a result, is averaging 4.1 yards per carry thus far — a career-low if drawn out through the end of the season. Jackson isn’t worried though. From his perspective, it’s all about making adjustments on the fly when he sees eight or more defenders in front of him. Going forward, the Cats’ passing attack will face tougher tests than they have seen to date. Thorson had one of his best games against Nebraska in 2015, but this year the No. 20 Cornhuskers (3-0) are an early contender for the Big Ten West. Nevertheless, Fitzgerald won’t back away from the passing game any time soon.